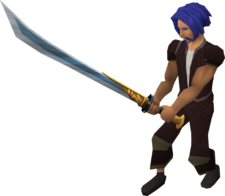 The Ornate Katana is a vanity item offered to those who buy a 90 day membership card from Gamestop between 20 June and 10 July 2011. This has caused quite the controversy as many players are claiming this promotion is no different than a player selling an item or gold to another player for IRL money. What's your opinion or thoughts on the controversial matter? This topic already has an extensive discussion on the subject. You do not buy the katana, you buy membership. You get the katana for free. Do you dare to dream? - Part 19 added. || The Hospital (WIP) - New story! Necromagus looks like a viking ... with glasses.